Final Challenge Champion: Microsoft Surface 3 with 128GB/4GB memory configurations, Surface 3 Type Cover, and Surface Pen. There will be a different contest theme for each week, but the mechanics are the same: in 100 words or less, submit your experience using Windows 10 in the most creative manner. Entries can only be submitted via a Facebook or Instagram post with an equally creative image of your choice, and your caption should include the hashtag #MYWindows10Story. Each week, Microsoft Malaysia will be selecting three winners, and one weekly winner will qualify for the Final Challenge, where they will have a 1 in 4 chance of winning the Microsoft Surface 3 package. 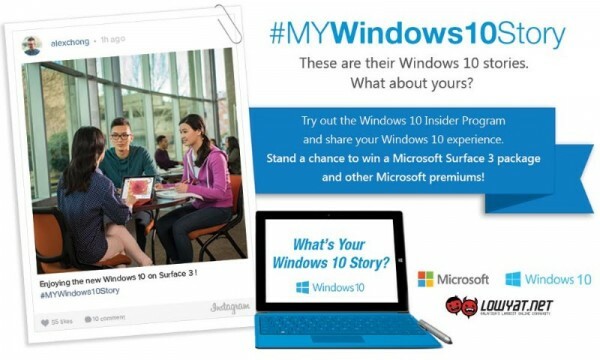 Visit #MYWindows10Story contest for more details.